Over the last three years the CONVERGE research initiative, funded by the Federal Government, has concerned itself with the technical and operational framework of a cooperative architecture for the communication of vehicles with the transport infrastructure, service providers and other vehicles (V2X-communication). Today the project has presented its results. Through its research CONVERGE has created a basis for the organisation and operation of a Car2X system network, in which vehicles can safely communicate with other vehicles, with service providers or with components of the transport infrastructure. "Only if we manage to combine various communication systems such as wireless LAN, mobile telephony and broadcasting, can we optimally use information about traffic conditions," project coordinator Horst Wieker said at the presentation of the CONVERGE results. 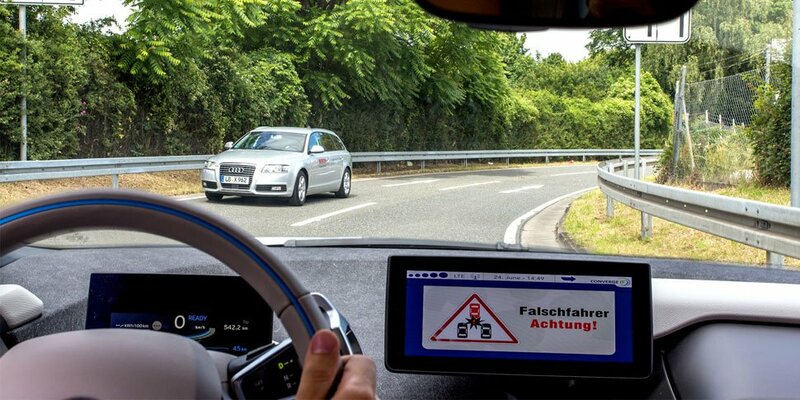 Starting from the existing development and expertise in the area of security of Vehicle-2-X systems, Fraunhofer FOKUS has contributed to a multimodal security solution. This implies that the effective security solution implemented will be available on all communication technologies used within the project (ITS G5, 2G/3G/LTE, Wi-Fi) to ensure authenticity, integrity and confidentiality for the exchange of sensitive data. Furthermore FOKUS contributed a Service Directory and a concept for a thematic news service. One of many possible application scenarios is wrong-way driver notification: The cooperative road infrastructure identifies a wrong-way driver; within a split second the driver and endangered road users in the immediate area receive a warning on their Smartphone or on the navigation screen, for example. Following the example of the Internet CONVERGE strives to create an architecture, which allows any number of possibly varying content- and service providers to interact in a protected network and to disseminate information as needed. Horst Wieker stressed that it is not just about indicating danger: "If traffic reports are intelligently networked with the planned route of a truck and the current availability of truck parking areas, freight transport can be routed more efficiently. This avoids delays at loading ramps and supports the drivers in complying with their statutory rest periods." In preparation of nationally and internationally recognised standards for the V2X architecture CONVERGE has involved numerous service providers, traffic control centres, road infrastructure- and mobile operators, automotive manufacturers and suppliers, IT service providers, as well as universities and research institutes. To meet the requirements for data protection, CONVERGE has developed an integrated IT security concept which protects the data of users (e.g. movement data) and also ensures high quality internal and external services.